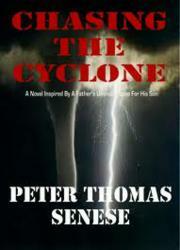 Peter Thomas Senese's novel Chasing The Cyclone has been called by numerous left behind parents targeted for child abduction as s critical read and resource used in preventing their own children from being abduciton, while numerous book critics have praised Peter Thomas Senese's novel as a gripping, well-written thriller that serves as a call-to-arms against child abduction. Peter Thomas Senese's new novel Chasing The Cyclone has been hailed by book critics and child abduction prevention advocates as a road map on how a parent may either prevent the international abduction of their child or reunite with their child. Mr. Senese's novel takes the reader into the odyssey of a parent's attempt to prevent a child's international abduction, only to have the courts fail to initially recognize the intent of the abducting parent. As international parental child abduction continues to be a grave concern for thousands of parents each year, resource guides that outline child abduction risk factors and preventive measures against abduction are critically important. Chasing The Cyclone provides parents with keen insight on these issues. Chasing The Cyclone is now available at all major e-book retailers including Amazon and Barnes & Noble in English. Spanish, Italian, and French e-book versions of Chasing The Cyclone will be released in May, 2012. Chasing The Cyclone is now available at Barnes & Noble in e-book for Nook readers. Previously, Chasing The Cyclone was made available exclusively on Amazon as Mr. Senese donated 100% of his royalties to the I CARE Foundation, an organization created to assist parents and children targeted for abduction.